Rubberflex Eco-Floor -- the ideal Heavy Duty Flooring for weight room flooring, iceskating arena flooring, equine facility flooring, and more! Rubberflex® Eco-Floor is a product that helps protect our natural resources while expressing a deep respect for our environment. 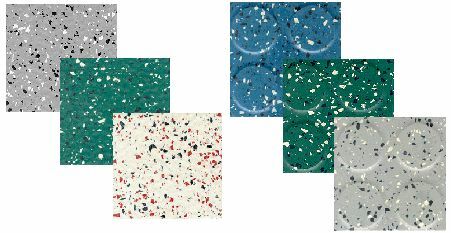 Eco-Floor is manufactured with first grade recycled components that are technically first grade quality. It is manufactured with first grade recycled components to minimize production waste and eliminate the need for disposal, while maintaining the competitive edge. This flooring represents a long lasting investment in your facility. Eco-Floor is a beautiful alternative to our recycled rubber line. Great for weight rooms, entry areas, Ice skating arenas. Available in a hammered or circle pattern. Comes in 1 m x 1 m x 3/8 tiles. The unique compound of Eco-Floor makes it the ideal solution for special flooring, i.e., where sports equipment might dig into the flooring. Also, its hammered surface and sprinkled, non-directional patterns are designed to withstand heavy traffic and hide stains, scuffs and indentations. Eco-Floor is specially formulated for extreme resistance to cuts, punctures and tears. High density and excellent elasticity enable this rubber flooring to withstand even the extreme real life tests. In keeping with the growing market demand for recycled products, Eco-Floor is designed for all market segments, from commercial to industrial areas. Color coordinated stair treads in all dimensions and accessories are available. Ice Rinks -- Ideal flooring since ice and skate blades will not destroy this floor. In the wet areas of ice rinks, the classic round, raised pastille-type drains water and keeps feet dry. Golf Facilities -- Eco-Floor is a proven surface for golf club houses since golf spikes cannot hurt this floor either. 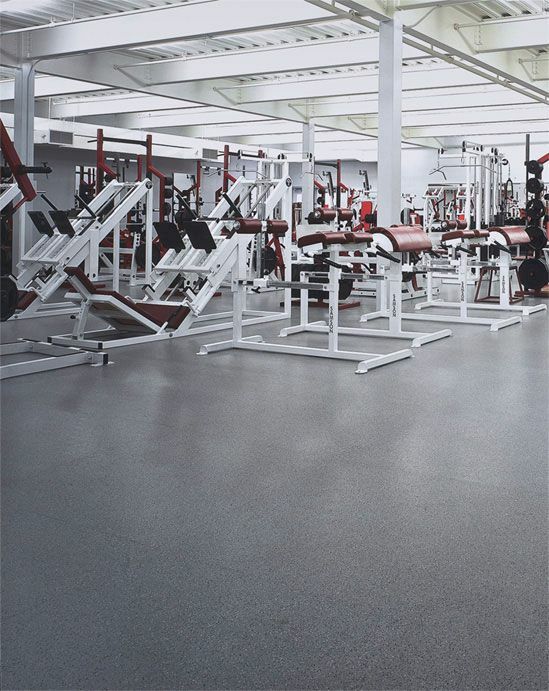 Fitness Facilities -- Great for weight room floors, hallways, entry ways and dry areas in locker rooms. Equine Facilities--Even your most finicky horses will appreciate the comfort and durability of Eco-Floor. Hammer-toned for dry areas. This texture is available in granite, amazona, agate gray and pacific blue (pacific blue not shown).